This is a letter to three major manufacturers of sanitary napkins in India. So far, SWaCH has received responses from government leaders but manufacturers have not responded. Managing Director, Proctor and Gamble (india) hygeine and healthcare LTD. I would like to bring to your attention the issue of Sanitary Napkin Disposal in Pune. A wastepicker organizations has approached us to make the handling of this sanitary waste more humane. Currently wastepickers have to deal with this waste as part of household waste that they collect and also when they are picking from containers, dumps and landfills. In the recent years the amounts of this waste is also rising rapidly. 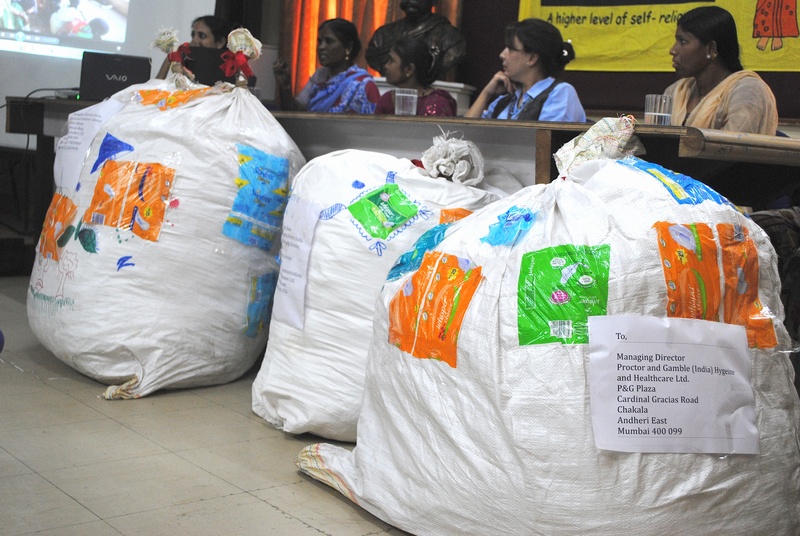 As you can imagine handling this waste with their bare hands is particularly degrading and can impact the health of women who can have a compromised immune system from malnutrition and hardships. As a citizen I am particularly appalled by this situation. An organization SWaCH which gives us the service of door step collection, manufactures simple newspaper bags that are easily identifiable. Wastepickers have reported that this has definitely helped. We know that the responsibility of the entire life cycle of a product is placed on the manufacturers who produce these products as part of their Extended Producers’ Responsibility (part of the Plastics Waste managment and handling rules 2011). In this case products like sanitary napkins and diapers. Enclose a bag along with napkin packages to dispose this waste with a clear identifiable mark that wastepickes can be trained to recognize. You should also increase awareness about how to dispose this waste and extend your interest in women’s health – from users to post consumer waste handlers as well.